There’s something about crisp autumn air that makes me want to create DIY rusty fall decor with Dixie Belle Patina Paint! “Rusty” glass vases are an easy and fun project, part up cycling and part chemistry experiment. I used Dixie Belle Patina Paint to transform several glass items from the thrift store into DIY rusty fall decor. Then I added dried flowers and mini pumpkins to bring a little bit of fall flair into my home. This post contains affiliate links if you want to try out Dixie Belle Paint’s awesome products. Dixie Belle Paint Company is the no-VOC chalk mineral paint we sell at our store All Things New Again in Leesburg, Virginia. Dixie Belle Patina Paint is a super-fun, super-easy (kinda messy) way to create a wonderful vintage or rustic industrial look on furniture and more. I started my DIY rusty fall decor project with several glass items purchased at Goodwill. When treasure hunting for items to patina, I look for anything with an interesting shape—like the tall glass bottle with stopper and the star-shaped paperweight. After washing all of the items, I applied another product from Dixie Belle Paint Company called Slick Stick. I don’t use Slick Stick on everything, but it is an awesome problem solver when you need it. Slick Stick bonds nicely to glass, helping the Dixie Belle Patina Paint adhere better to the slick surface. Time for the chemistry to begin! With Dixie Belle Patina Paint, you are not creating a faux rusty paint effect. You are creating actual rust—even on non-metal objects. Pretty cool! Use IRON Patina Paint + GREEN Patina Spray to create rust. You can’t see it, but Dixie Belle Patina Paint actually has tiny bits of metal finely ground into the paint. When the Patina Spray hits, a chemical reaction begins. After a few hours, rust begins to form on the object you just painted and sprayed—even a non-metallic object like this glass paperweight. My favorite part of transforming these thrift store vases into DIY rusty fall decor was experimenting with different ways to apply the Patina Spray. I sprayed and let it drip in sections, brushed on some sections and used the net baggie my mini pumpkins came in to “sponge” on a design in some sections. Rustic industrial home decor is so popular right now and fits with many decorating styles from farmhouse to industrial. I love the look, but it usually doesn’t match my home. However, in the fall, anything goes! I love adding little rustic and industrial touches to my home this time of year—and Dixie Belle Patina Paint is perfect to create DIY rusty fall decor. Here’s the link again if you want to try out Dixie Belle Patina Paint. 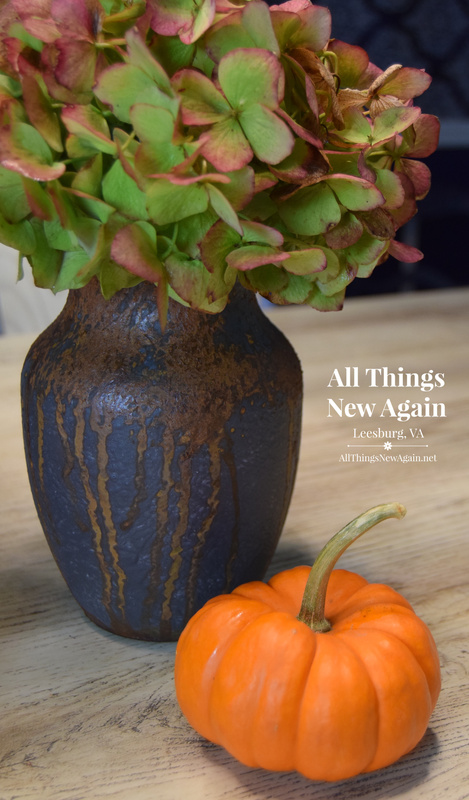 All Things New Again is a furniture store and paint boutique in Leesburg, Virginia (about an hour or so west of Washington, D.C.) We sell hand-painted furniture, home decor and several lines of paint for your next DIY project, including Dixie Belle chalk mineral paint. If you live near Northern Virginia, please join us for a Saturday Morning Paint Workshop. Create a cute seasonal project to take home and enjoy. Here’s our Fall Schedule of workshops. Paint with us … wherever you live! Our next Virtual Paint Party is Friday, October 26. Click here for details. Me too! 🙂 Thank you Adele! This turned out super pretty!Love the texture! I love this and now I think I need it! !